Photo Critique Series: “Finnich Gorge” by David Dalziel from Michael Frye on Vimeo. I decided to try something new for this latest critique, and record my thoughts with video screen capture. I hope this will create a more interactive, immersive experience, as if you were watching me do a portfolio review in a workshop. Let me know how you like it! To see the best detail, be sure to watch the video in HD and click the four arrows in the lower-right corner of the video to expand it. Once expanded, I prefer to turn scaling off (in the upper-right corner). This week’s photo was made by David Dalziel in Finnich Gorge, just north of David’s home in Glasgow, Scotland. Recently I wrote about the third dimension in photography, and how lens choice can affect our perception of depth and space in a photograph. Then in my last critique I showed an example of how a telephoto lens can compress space, flatten perspective, and create patterns. 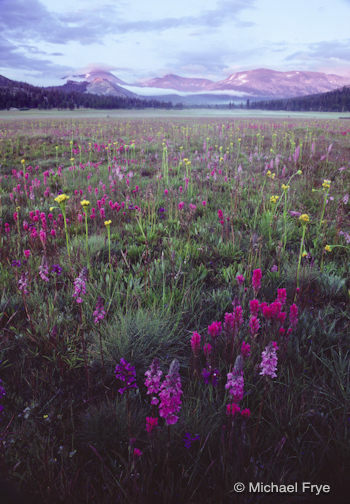 This time we’ll look at the opposite: a wide-angle composition that creates a sense of depth, even though it’s not a grand, sweeping landscape. 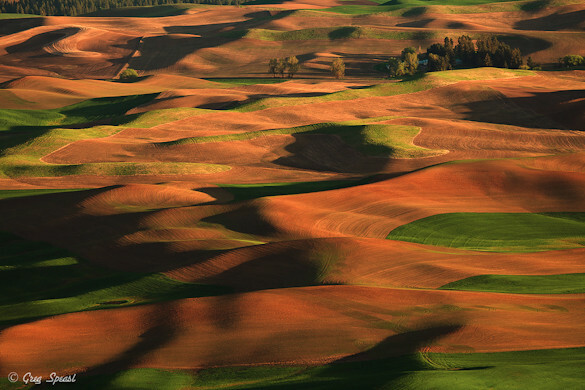 This week’s photograph, titled “Steptoe Beauty,” was made by Greg Speasl in the Palouse country of eastern Washington. The image is an interesting study of how a telephoto lens can compress space and create patterns. Sidelight is usually a great way to bring out textures, and here the low-angle, late-afternoon sun raking across the fields from right to left brings out the beautiful textures and forms of the landscape. The alternating patterns of green and amber also create a nice color contrast. Recently I wrote about depth in photography, and how wide-angle lenses can help create an illusion of depth, while longer focal lengths can flatten the perspective and emphasize patterns. This is a great example of the latter—Greg used a telephoto lens (210mm on a full-frame sensor) to zoom in, compress the space, and pick out an intriguing pattern in the sculptured hills. In fact we see two overall patterns here, one formed by the interplay between light and dark, the other created by the color contrast between regions of green and amber. The critiques are back! With my trip to Utah, and then having to restore the blog, it’s been awhile, but I’m happy to be able to present another photo critique this week, and I hope it won’t be so long until the next one. Thanks for your patience! 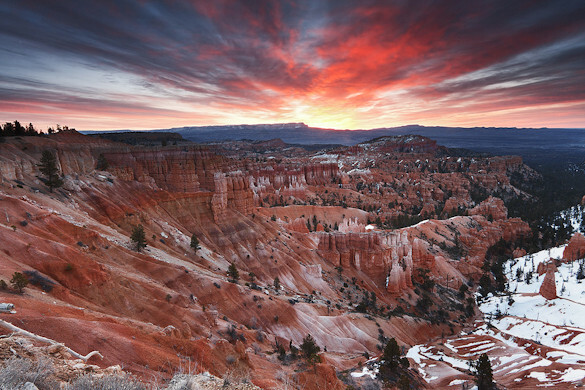 This week’s photograph was made by Raymond in Bryce Canyon National Park, Utah. Perhaps the most striking feature of this image is the colorful sky, with clouds appearing to radiate out from the sun just before it clears the horizon. The warm hues of the red-orange clouds, along with the rusty rocks, form a nice color contrast with the cool blues of the sky and distant mountains. What I like most about this composition is how the foreground and background complement each other. Those radiating lines in the clouds are subtly echoed by the folds in the landscape below. 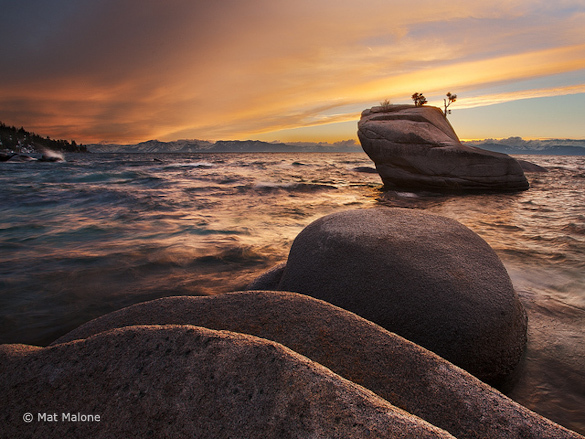 This week’s photograph was made by Mat Malone along the eastern shore of Lake Tahoe, Nevada. What first caught my eye about this image was the composition, with the layered, repeating shapes of the foreground rocks leading the eyes toward the more distant rock with the “bonsai” trees. In some other critiques I’ve taken issue with foregrounds that didn’t seem to work, that really didn’t add to the photograph. This, on the other hand, is a strong foreground, something that contributes greatly to the overall effect of the image. 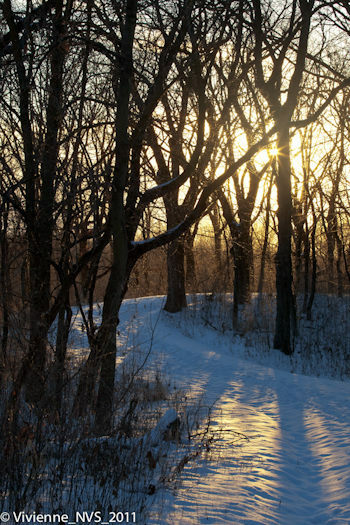 This week’s photograph was made by Vivienne Shen at Moraine Hills State Park, near Chicago, Illinois. The light in this image really caught my eye, with the sun peeking through branches, the long tree shadows in the foreground, and the golden, late-afternoon colors. The light, bare trees, and snowy ground combine to create a strong mood—cold and wintry, but with a hint of warmth. There’s nothing special about the weather here; you could probably capture similar light on any clear winter afternoon. This shows that you don’t need extraordinary conditions to convey a mood—you just need to visually emphasize the conditions you have. Here everything in the frame (snow, bare trees, low-hanging sun) communicates the idea of a cold, clear, winter day.